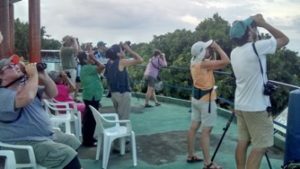 ‘River of Raptors’ makes Veracruz raptor migration tour unmissable! Naturalist Journeys is heading to Veracruz, Mexico this fall for a raptor migration tour: a bamboozling bird count! I was recently at a meeting and heard my good friend and colleague, Dr. Ernesto Ruelas, recount the history behind the establishment of the Veracruz River of Raptors hawk migration project many years ago. 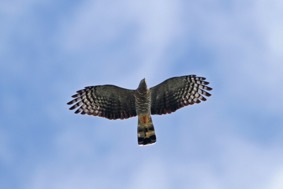 Ernesto, now on the faculty of the Universidad Veracruzana in Xalapa, Mexico, first became interested in the hawk migration there many years ago when he was a young boy, and he became inspired by the sheer number of migrating birds. His talk got me very excited about our upcoming raptor migration tour to Veracruz from September 25 to October 5, 2019—you will not want to miss it! Birders in action at the Dr. Mario A. Ramos Migratory Bird Observatory in Chichicaxtle, in 2016. The talk also reminded me to look up the data on the fall 2018 hawk count in Veracruz, and as usual, the numbers were outstanding! 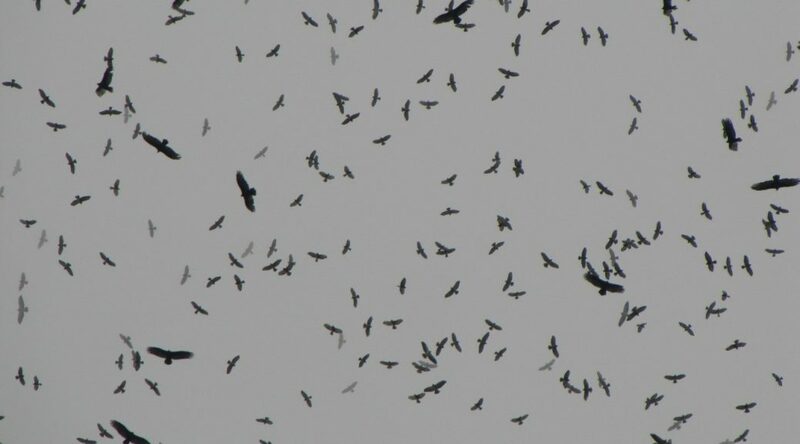 A total of 2,122,814 raptors were counted in the town of Cardel, and 2,270,056 in the nearby town of Chichicaxtle! Even though I’ve been there before, it’s still hard to imagine that many hawks passing through a single site – the perfect destination for our raptor migration tour. 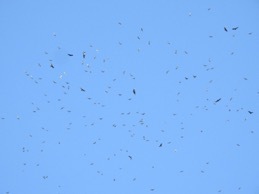 Here’s what the “River of Raptors” looks like from below—a mixed group of vultures and buteos from October last year. As has generally been the case, the most popular species in 2018 were Turkey Vulture (1,081,774 in Cardel), Broad-winged Hawk (844,258 in Chichi), Swainson’s Hawk (321,064 in Chichi), and Mississippi Kite (131,813 in Chichi). However, a total of 16 other raptor species were counted during last year’s fall season, illustrating the diversity. Plus, certain species that were not known to be very migratory have regularly been recorded there, such as Hook-billed Kite (101 in Chichi). An intriguing neotropical raptor during the fall 2016 migration. The thing is, there’s so much more to this trip than migrating raptors! Pelicans, storks, flycatchers, subtropical and tropical birds, archaeology, museums, good food—this trip has it all! 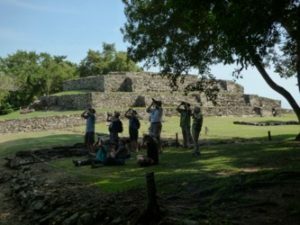 Group of folks birding AND learning in 2017, about pre-European civilizations along the coast of Mexico.